This week has been a fantastic week for me in terms of NSVs. Monday, I walked at a pace that puts me at a 25-minute mile, which is my goal for Saturday’s 1-Mile Mosey. Tuesday, I figured out that I still had a long way to go in terms of learning about how to conduct this new lifestyle I’ve adopted and co-opted. Today… I crossed my legs for the first time in years. I was sitting alone in the storeroom eating my lunch, and I have no idea why I was even thinking about it, but I decided what the hell, let’s see if I can do it. So I hiked up my left leg and slowly slung it up over my right knee and lo and behold, my legs were crossed. This evening while we were watching “Scandal,” I said to my husband, “Look what I can do” and I proudly showed him my new party trick. And I thought about it, and he was right. In the ten years we have been together, he’s never seen me cross my legs. He’s never seen me squat down on my haunches (my next mobility/flexibility goal). He’s never seen me sit cross-legged. There are so many things he hasn’t seen me do because it’s been so long since I’ve been capable of doing them. It makes me wonder what all he’s missed out on knowing about me because of my fat. I already know what all I have missed because of my fat, and I’m determined not to miss out on any more things because of my fat. It’s slowly leaving me, and I couldn’t be happier to see it go. Today’s eating was just meh. Protein was good: 89 grams, and fat grams were 35. Carbs were well under 50 grams today at 39. Today was one of those days where I just didn’t feel like eating. This week I haven’t varied my calorie counts each day to keep my body guessing about how much it’s going to get fed, so I’m thinking the scale may not show me much progress this week but I’m okay with that. I’m more worried about the eating challenges that I’ll face this weekend as I travel down to Central Texas for my alma mater’s Homecoming. There is only so much planning one can do, but I will do my damnedest to undereat my capacity and get all my water in while we’re away. I’m packing my “sippy cup” (as my husband calls it) and a water bottle so that I always have something to drink. I’m excited about getting to see and visit with friends I’ve known for over 20 years now (!!!) but who I don’t get to visit with often. That’s the focus of the weekend, really. I am thrilled to be going “home” again, as a newer, healthier version of myself. 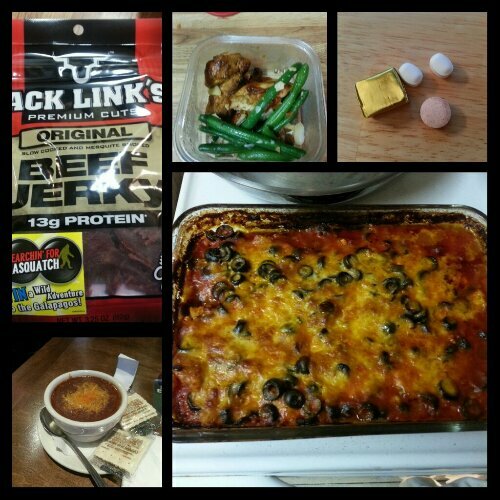 Today’s food choices, from upper right: multivitamin and calcium supplements x2, iron supplement; chicken pizza casserole; leftover chili and saltine crackers; Jack Links beef jerky; honey barbecue chicken breast with green beans almondine. This entry was posted in being thankful, celebrations, daily bites, eating, NSV's, post-op, the sleeve, vsg, weight loss surgery and tagged benefits of wls, challenges, daily bites, little celebrations, medications after VSG, NSVs, post-op eating, post-op life, things of win and awesome, VSG, vsg realness, WLS. Bookmark the permalink.